Ferrari F355 Oil Painting by Franz Röhrig. 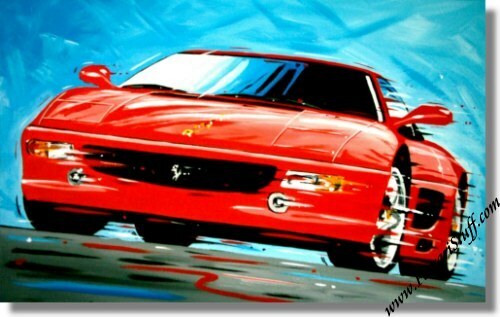 This great painting of a Ferrari F355 at speed was made by German car illustrator Röhrig. Röhrig's work has been published in many German magazines amongst which "Bunte", "Capital" and Germany's leading car magazine "Auo Motor und Sport". Materials used are acrylic paint on linen. The painting comes on a wooden frame (not visible). There is no decorative frame but since the edges of the linen are also painted, it can be displayed "as is" or you can have it framed to your own taste. It measures some 70 x 50 cm or 20 x 28 inches and is signed by the artist.